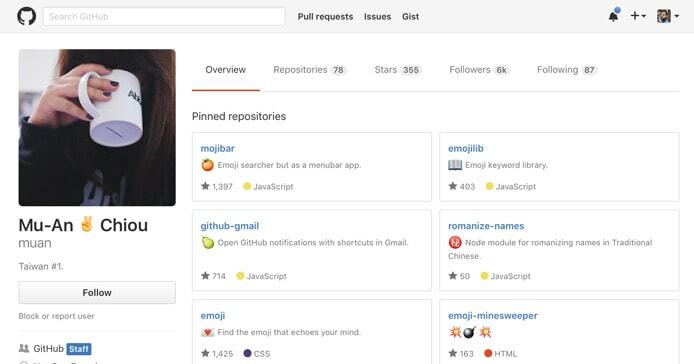 TL; DR: GitHub simplifies the way developers — from hobbyists to professionals — build software. An idea first discussed at a bar, GitHub fosters a fast, flexible, and collaborative dev process where you can create and share your work on anything from personal projects to major open-source technologies. In 2016, GitHub announced their biggest update — bringing robust review, security, and project management tools to the platform. Now valued at $2 billion and boasting more than 600 employees around the world, the brand is continuing to change the way developers work. These two guys walked into a bar… and developers’ lives changed forever. Tom Preston-Werner was sitting in Zeke’s Sports Bar and Grill, a nondescript San Francisco dive bar that was friendly to Giants fans and technology nerds in equal measure. He was there for a Ruby meetup but sat in a booth alone, mulling over a project he had started a week before. In walked Chris Wanstrath, a developer Tom vaguely knew but admired. Tom gestured for him to sit down at the booth and shared his idea for something called Grit that allowed him to access Git repositories in an object-oriented manner through Ruby. The end result for Tom’s so-called “half-baked idea” was a website that acted as a hub for developers to share Git repositories. He even had a name in mind — GitHub. A week after their fortuitous meeting, Chris made the first commit to the GitHub repository. That kicked off three months of intense development — Tom worked on Grit and the platform’s interface while Chris constructed the Rails application. The pair launched a private beta in January 2008. A month later, PJ Hyett joined the team and helped get GitHub ready for their public launch in April. Three short months later, Tom walked away from a full-time salary and a $300,000 signing bonus offer from Microsoft, who had acquired his employer, Powerset. “Just as Indiana Jones could never turn down the opportunity to search for the Holy Grail, I could no less turn down the chance to work for myself on something I truly love,” he wrote in a blog post. Now, GitHub supports a community of more than 16 million developers who host more than 38 million repositories. You can find the code that sent Apollo 11 to the moon, along with well-known modern tools such as Bootstrap, Node.js, Angular.js, jQuery, and Font Awesome. Chris, now GitHub’s CEO, announced the platform’s largest update in September 2016, ushering in a bevy of new features and plans to add even more in the future. Speaking to the collaboration core of GitHub, the platform introduced commenting tools to pull requests. Team members or peers can put your code under the magnifying glass to make sure you ship nothing but the best. 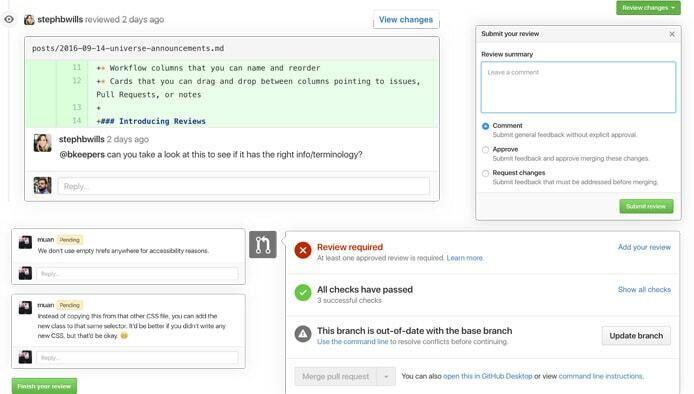 With GitHub’s new code review tools, developers can comment and request changes before code is merged. Approve code, request changes, or discuss possible solutions with inline comments. Developers can also protect branches by requiring at least one approval and no requested changes before any new code can be merged. Beyond maintaining code, developers can now use GitHub to organize and distribute the work in your queue. Craft your own framework of workflow columns to track the status of the various elements in your project. GitHub’s project management tools bring a familiar organizational flow to where developers work. Create cards through pull requests, issues, or notes, and then drag and drop the cards throughout the various phases of work. The highly customizable interface adapts to your team’s needs, supporting long-term planning and prioritization. While user profiles are nothing new in GitHub, they now feature more information about your history on the platform: your first commit, first pull request, and more. Your GitHub timeline showcases your most important triumphs and contributions. Pinned repositories appear above the familiar green squares, enabling developers to showcase their favorite projects. Learn in which repositories you spend your time each month, and pin your favorite projects to the top of your profile. GitHub is boosting transparency and collaboration with their engineers by sharing a roadmap of upcoming features their team is working on in the short-, medium-, and long-term. One of the first releases includes making integrations first-class actors instead of requiring user impersonation. Admins can directly configure and control integrations across the organization without using a paid user account. By actively soliciting feedback and providing integrators early access to new features and APIs, GitHub is taking a more involved and collaborative role with the very communities they support. Organizations can better protect their proprietary code by enforcing 2-factor authentication and receiving notifications about users and forks that aren’t in compliance. Businesses on GitHub will soon have more tools to automate identity and access management through a SAML-based single sign-on option. Administrators will be able to more easily manage users’ permissions and access. Arriving in 2017, the GitHub Community Forum will offer another way for the platform’s 16 million developers to connect, get help, and learn about new technologies. According to Chris, the forums will also offer another venue for GitHub to introduce new features and improvements — and receive direct feedback. With GitHub’s launch in 2008, Tom’s project Grit became the world’s first Git bindings for Ruby. 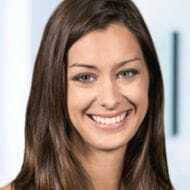 Even though keeping the program as an internal, proprietary tool would present a tougher challenge for competitors, the Co-Founders decided to open-source Grit. According to Tom, open-sourcing code makes great business sense: Sharing code fosters goodwill, attracts talent, and enables communities to get more work accomplished in a faster and less expensive manner. Dedicated to open-source communities, GitHub now employs more than 600 people. GitHub shared their “state of the Octoverse” report, which showed nearly 6 million users have accessed public repositories in 2016. More than 330,000 organizations — including Microsoft, Facebook, Docker, and even The White House — contribute and share projects to the world’s advantage. Although Tom left GitHub in 2014, he reflected in a blog post about how GitHub’s journey during their first year primed the company for their massive expansion. “The first year of a web offering is a magical one,” he wrote. By identifying a promising use of technology before practically anyone else, the Co-Founders built GitHub as a side project with almost no overhead or competition. They capitalized on rapid deployments and agile iterations to roll out new features early and often. In the first year, GitHub was bootstrapped and profitable as soon as they opened to the public and charged for subscriptions. Almost a decade later, however, GitHub has raised $350 million in two financing rounds so far. The $250 million investment from Sequoia Capital in 2015 placed GitHub’s valuation around $2 billion. The additional funds empower the company to take risks and expand sales and engineering teams, Chris said in a TechCrunch article.